With the Willamette River and the McKenzie River converging just north of Eugene, there is no shortage of local swimming holes in this area. Parks along either river provide ample and easily accessible opportunities to cool off when the heat cranks up, whether you're in the mood for a dip in the icy McKenzie or some slightly warmer options in the Willamette. Yet some of the most incredible swimming and paddling spots can be found a little farther upstream. Both the McKenzie and the Willamette have a vast network of tributaries that run out of the Willamette Foothills, and the intrepid adventurer need only hunt on a map to trace these waterways toward their pristine origins. Brice Creek from the Brice Creek Trail. Photo by Halvor Tweto. Many of these waterways have been dammed, creating a significant reservoir system that surrounds Eugene. Dexter Reservoir, Fall Creek Reservoir, Dorena Reservoir, and Cottage Grove Reservoir are all within an hour's drive from Eugene, and these are great options if you are looking for parks. Added infrastructure such as designated swimming areas, picnic tables, restrooms, campgrounds, and even the occasional store can make these areas a sure bet for posting up on long stays near the water. If you are looking for a smaller, less developed experience, look still farther upstream to the rivers and creeks that fill these reservoirs. 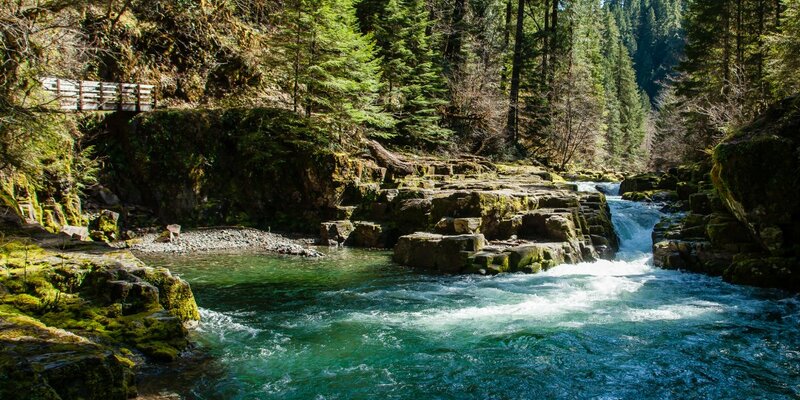 The Row River feeds Dorena Reservoir and hosts one of the central Willamette Valley's most famous swimming holes in Wildwood Falls, and the the Row's tributaries such as Sharps Creek and Brice Creek are home to several sweet and shady places to cool off. The Fall Creek drainage is another excellent one to explore in a search for smaller swimming holes, and the Fall Creek Trail is a perfect way to explore it. If you continue southeast along Highway 58 to Oakridge, you'll enter another nexus of significant tributaries. The mighty Middle Fork Willamette River gets harnessed into three giant reservoirs: Hills Creek, Lookout, and Dexter. Salmon Creek joins the short stretch of the Middle Fork Willamette River between Hills Creek and Lookout right in Oakridge, and this creek has several spots that are great for a quick dip. Salmon Creek Falls is one of the best, and the adjacent campground and nearby mountain biking make this an ideal weekend destination (if you can find a spot). Alternately, the North Fork Middle Fork Willamette River, which joins the Middle Fork near the town of Westfir, has several beautiful pools stretched out along its course, each worth a stop. Before heading out to any of these spots, however, consider the impact they receive. Put some water and sun together, and some folks take their recreation to pretty offensive levels. We've all seen beautiful places suffer from the thoughtless use of a minority of people. Keeping secrets about locations is no real solution, however, as it only disenfranchises responsible users and undermines a public connection to public lands. Instead, we all need to pitch in to make sure these fragile areas are treated well. At the very least, take a little litter out with your own garbage, leave the tunes at home, and don't bring any glass. A few obnoxious users can easily ruin a beautiful place. Remember, you can be a steward for these public lands, too: engage with them, care for them, and enjoy them!